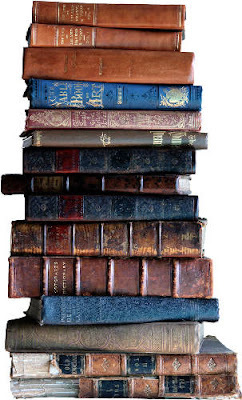 "Avid readers know that a stack of books can be a comforting sight. We've taken authentic vintage books and turned them into art objects by removing their covers and binding them together in sets of four. Neutral in color with deckled and uneven pages, they bring relaxed style to a bookcase, mantel or side table." Ok, why remove the covers on vintage books? And why bundle them together? I don't get it! Here are some authentic vintage books on my bookshelf that are neutral in color. It's true, they are a comforting sight for this avid reader. "Each bundle features four real books with covers removed so that they are all paper. ....Purely decorative; content and title are not important." Although the cover fell of this book, its content and title are still very important. This avid reader is not comforted knowing the pages are also glued shut! So why pay $39 for four books that are completely unreadable? Oh, I forgot, they are "purely decorative....."
Pottery Barn was right about the comforting sight of a stack of books. Which brings me to the subject of "Decorating with Books." 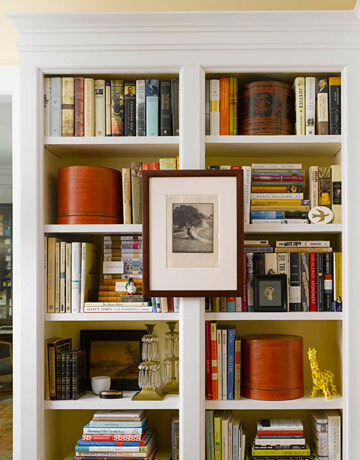 Books have always been an integral part of the decor in our homes. Even if it's just a dictionary or a Bible, they are an important part of our lives. They can also be the anchor in a room, like the library above. Libraries are also a comfort, at least for me. Alassandra Branca's red library is simply wonderful! I hope to someday create a room like this in my home. Another favorite image is this library designed by Jeffrey Bilhuber. There is definitely an art to arranging books on a shelf. 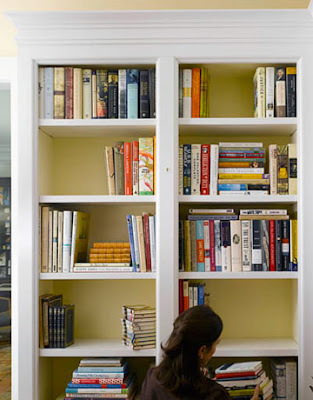 I came across a great tutorial by Elizabeth Mayhew of House Beautiful on how to design a bookshelf so that it is more than just a bunch of books all lined up. Step One: Empty your shelves. Then paint the backs, or line with wallpaper. Step Two: Sort books by size and color. Line books, some vertically, some horizontal on the shelves. This will alleviate the monotony of rows. Step Three: Fill unused space with attractive boxes that can also be used for storage. Step Four: Start adding family photographs, ceramics or other objects d'art. Step Five: Be daring and hang a print on the shelf moulding. The finished bookcase. Isn't it beautiful? This is what I call "Decorating with Books!" PS: I still love you Pottery Barn! Couldn't agree more. I much prefer the books w/ covers, that aren't glued shut. Guess it goes w/ all the neutral colors that are out there now. Boo Pottery Barn....I cannot imagine destroying bound books by removing the covers and gluing them! I prefer the real thing! Well put! I couldn't agree more. You certainly deserve to be applauded for speaking up for READING REAL BOOKS! They are never 'only' decorative. 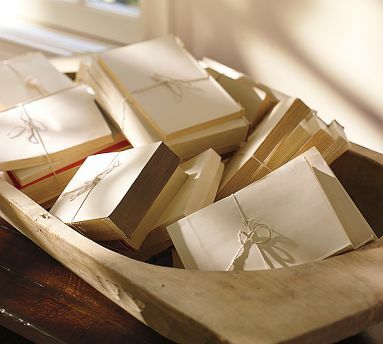 The saying of: 'Show me your books and I will tell you what kind of person you are...' speaks even louder to the sealed up and glued SHUT Pottery Barn bundles of $ 39.00. What statement are they trying to make? It's a looser in a society with highly educated people! I agree with you about the absurdity of removing beautiful book covers and going one step further to glue the pages together rendering it unreadable. Who are the people that will find these things desirable? Agreed. 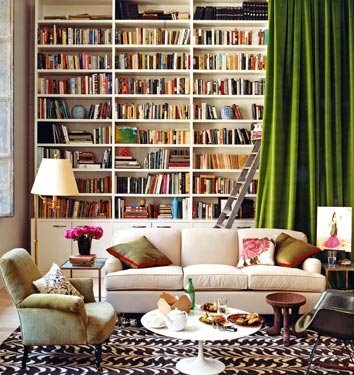 I love to decorate with books almost as much as pillows. ;) Great post! Amen!!! I couldn't agree with you more. Hear! Hear! You are so right! I just couldn't understand why anyone would lay out hard earned cash for that! LOL! I have to say, that elevates consumerism for consumerism's sake to a new level. Used to be, only the wealthy who could afford (and read) had books. Now the wealthy want books that are destroyed and "purely decorative". That's just silly. And the current trend of ripping off the covers, while giving a nice texture and color to a room, bothers me as well. I think I'll just do like you and use my functional books as decor items so they can multi-task like the rest of us! Great post, Delores.I love to decorate with books. wow, so many more than I expected to agree! bravo, i agree completely!!! Well, for having lost a couple of followers, that speaks book volumes about THEM; NOT YOU! Don't worry; keep your own class and style ~ that is everlasting! I love this post but I have to say I am a fan of the "No cover" books. I just love the look of them. However, I think the price tag is ridiculous to say the least. I just grab old books from garage sales or thrift stores for pennies, rip off the covers and place them where I want. Although I am a voracious reader and love to have many books laying around, there's just something about the creamy, neutral color of these bare books that I love. I like to mix them both. I so get where Pottery Barn is coming from! Sorry to say as a designer with so many books there is no comparison to the old vintage ones with history. Like movies of old that are european in flavor and old warehouse shops that have tattered books beyond repair you take notice of the ones that have gathered up without covers. I just LOVE these old books in lost and found with very little life left in them but the words they hold. I adore that natural look of used old books as a piece of artful fancy. I too am guilty of this design style, it does make ones heart fill with passion when mixed with other pieces that add to a sense of style. I am not sure I feel so bad about that old cover that has finally fell off its binding. I will salvage the book and place it in its own special place wher it gets its own attention. I have one with out a cover that sits on my nightstand next to my bed that I read often, it has no cover and is cream with age in keeping with my lack of color in my bedroom. I love seeing it sit there reminding me not all things have to be perfect to bring love and joy into our home. The book is "when God winks at you"
When I read it from time to time I find myself winking back, and thanking him for all the creative beauty given to us. Come fo a visit you beautiful soul. Come visit my Romantic aviary retreats. I'm not a fan of this new trend. Nor am I a fan of a couple of other looks gracing the decor magazines of late. Such as covering all your books in an identical white paper, no titles showing. Or the one with all books facing the wrong way in the book case with the spines in and the pages facing out. Craziness. You simply cannot IMPROVE upon the look of a well loved book. Good post. I don't like to read, but I do love using books for decorating. I used the same PB pic in a recent post and so did another blogger the other day. I think everyone is blown away at the price of that book bundle. I buy 50 cent books at a thrift store to tear covers off of not good ones. The good leather ones are what I am collecting. I would never rip those up. REturn visit...You are going to get far more agreeing with you then not. I think that the lack of book cover craze is do to the Euro chicness of the Flea Market movement, and trend of all things natural. Like Burlap, feed sacks, linens and such. An Anthropology/ Anthropologie look!! As well as everyone getting on the band wagon of a trendy collective style. I am so with you on the book covers taken off for a big reason of sales. I am not sure they are taken of the famous classics, if so hmmmm! I do have mixed feelings. I hope they are abused and they are still loved for the right reasons for art and the love of the material. Thank you dear one for your beautiful post and visit. I LOVED your post today! Like you, I thought Pottery Barn might have made more income had they sold those books with the covers intact and readable! Vintage books are becoming a rare find. Why destroy them? 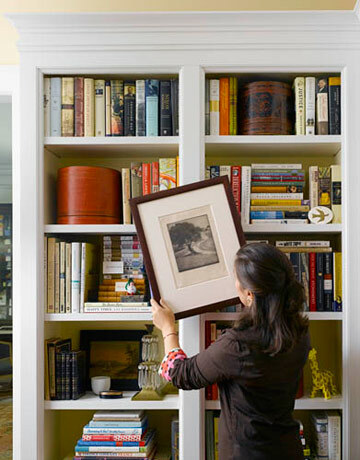 Your display on your bookshelves is elegant done. Thank you for such and inspiring post! P.S. I buy vintage books to use as risers to heighten my objects in display besides reading. I don't see any monotony in rows of books personally. That first library picture that you posted, doesn't it look like a quilt behind that couch? Beautiful! All different colors - rich looking. I'd much rather have that then a colorless stack of four glued together coverless books! could not have said it better.. glued shut? torn covers? that is sacrilege!! Thank you for speaking for us! I mean-really. Give me books. Real ones. On shelves, atop tables, on the floor. But make 'em REAL! I wonder what someone will think someday when we are part of some great "dig" and the generations of the future see our books with the covers off and the pages glued together? Perhaps they will think that we had some sort of magical powers that allowed us to put the books to our forehead and KNOW what was printed inside. A kind of ESP for books. I love books. I have lots of books and have read just about every one of them- except the ones on the "to read" shelf. I read to my kids when they were little and I read to my grandkids at nighttime now when they are here. There is nothing quite like the printed word, is there? I agree with you. I love the color of the covers and the wear from being read. That is much more decorative to me than books with no cover. Pages glued together.....give me a break!! I agree it's just silly... either decorate with books or dont- but why make a bundle like those? Are they for kindling? To me it's just ridiculous....I can't really imagine anybody looking at those and feeling any kind of comfort...we are getting silly when we decorate like that...I too love Pottery Barn, but nobody is perfect! I am totally with you and have yet to destroy any book, just couldn't do it...never found it an appealing look..
Sooo, my QUESTION is going to be pretty "HONEST and BLUNT"... what IDIOT would actually BUY THOSE??? I' ve ALWAYS wanted to turn a "formal dining room" into a library used for occassional AND "formal" dining AND reading... I can think of nothing more beautiful and fascinating, not to mention there could never be one of those rare "moments of silence" in a space like THAT??? Big hugs & "good reading", m' friend! Covers torn off, pages glued together, tied together with twine, $39.00. I don't know whether to laugh or cry. The only people goofier than the ones who came up with this stupid idea are the ones paying good money to buy them. Apparently they have money to burn, err, uh, destroy. Fools. It's part of the decor theme this season for Pottery Barn and they figured out they can actually sell this stuff to people. It's almost unbelievable. Totally agree! With the introduction of all the new "techno-type" books and downloading books to read on computers, I have a feeling actual books with real covers and pages will eventually become a thing of the past. We should treasure books of all kinds and not be tearing off covers and gluing pages together as a decorative trend! Great post Delores, I so agree with you, never take the beautiful covers off unless they happen to fall off on their own. Books are to be read not to be ripped up!!! I so stand up and salute you on this topic. I have been scoffed on other "so with it today" blogs for rising up in defense of books allowed to be books. I have books in almost every room of my house. They comfort me. The remind me. They entertain me. They inform me. One of the most lovely things my lovely husband has ever said to me, "A book in your hands is never wasted." I just have to say that I think you're taking this "book bundle" thing way too far and way too serious. I'm sure these are just mass produced and not actually high end great novels that were worth anything to begin with. We are talking Pottery Barn here! I think the idea of taking covers off an "ugly" cheap paperback book is fine. They are cheap to begin with and it's actually a way to recycle something. Tying them in a bundle is just for effect. What's the harm? We re-paint fine furniture and it's ALL over blogs. I don't see how this is any different. Sorry, I just have to disagree with you. Well, I was taught as a child to never deface a book in any way...don't write in it, dogear pages or anything. I still wince when highlighting or making margin notes as I read. 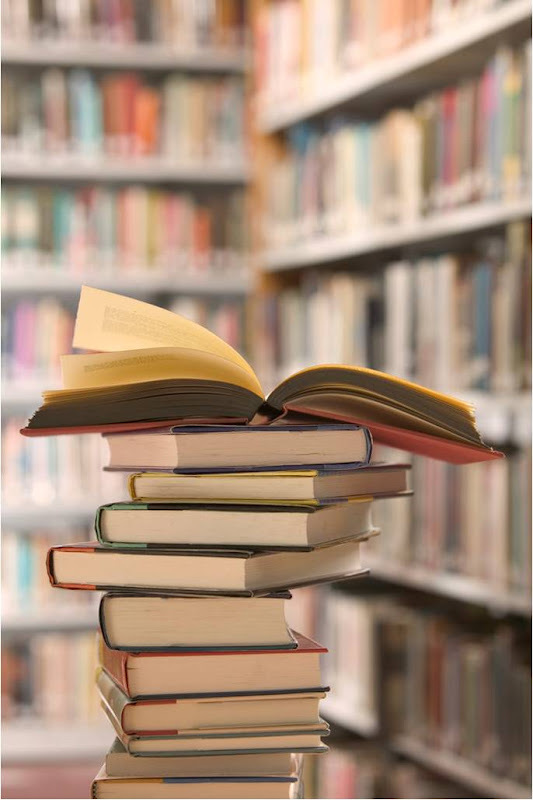 I've seen intact, often expensive books offered and sold by the yard for decorating purposes and imagined that the homeowners will not read or even know their titles. This feels a bit empty to me. I am a reader and I love books. 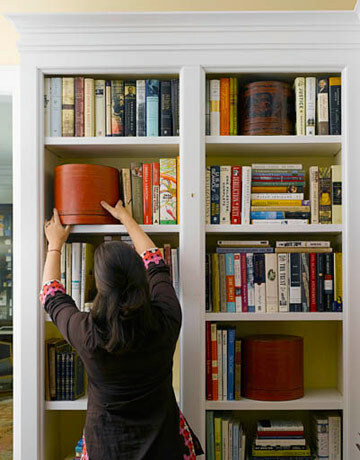 My house overflows with shelved and floor-stacked books in every room. I am often asked if I've read them all and the answer is yes, except for the ones waiting to be read. I'm fortunate to have inherited three small antique family volumes. Two are 19th C personal travel journals with marbled covers filled with tiny almost unreadable script. The third is a small leather-bound bible that belonged to my grandmother. Her name is engraved in gold on the front cover. The bible's binding is damaged and the front cover no longer attached. I suppose it could be repaired, but it's not at the top of my list. I wanted to display these books as objets of interest, but for the longest couldn't think how. Several years ago I saw a stack of books somewhere tied together with twine. i now have my little stack of three tied with a narrow vintage ivory ribbon. They look beautiful and can easily be untied if someone wants to read them. I'm not a total purist, but I'm not a fan of faux. And faux books are just a bit beyonf the pale for me. I didn't look through the PB catalog yet - thanks for the warning! I am Horrified!!!! Title and Content not important. I deplore the disposable mindset in our society. Thanks for bring this to everyone's attention. I just came across your blog, and your insights into home improvement, DIY projects, and overall design are very interesting. Your article about bookshelves was especially interesting. I really liked your comments on how to make a bookshelf more than just storage, but a centerpiece for the entire room. I am adding you to my favorites. Since you and your readers have a flair for interior decorating and interest in design, we thought you would especially be interested in our custom window coverings. Heritage Window Coverings is located in Huntington Beach, CA and we have a wide selection of treatments to complement any home’s interior design! Any feedback would be appreciated as well. As a special thanks to you and your readers, I would like to offer a 20% off coupon using this code upon checkout: BLG20. What an awesome post Dolores!!! Get ready to see a ton of books at the White Elephant Sale at the end of the month!! You're in right? Call me so we can make arrangements. I agree with you completely. Why dismember a book and take off it's beautiful cover, let alone glue the pages shut? I'd be willing to bet that the PB books aren't "vintage" at all. With no cover, no title page, and the pages glued together who would know? We have tons of books and if I wanted to do this, I would get junk hardbacks and go for it. The same with the book page wreaths. Just use junk books.